С целью сокращения расходов в условиях мирового кризиса 1920-х годов Министерство авиации приняло решение заказывать многоцелевые самолеты. Следствием такого решения стала спецификация 5/24 к двухместному самолету со сменным колесным/поплавковым шасси, предназначенному ДальшеMore>>> для использования в ВВС в качестве учебного, а в морской авиации - как учебного палубного с колесным шасси и учебного гидросамолета с поплавковым шасси. На конкурс было предложено несколько проектов, из которых отобрали Blackburn TR.1 Sprat, Parnall Perch и Vickers Type 120 Vendace. Sprat стал первым тренировочным самолетом фирмы "Blackburn" (TR - Trainer). Фактически он являлся увеличенным вариантом самолета Velos с измененной носовой частью фюзеляжа для улучшения обзора из кабины. Самолет имел смешанную конструкцию, но из дерева была изготовлена только хвостовая часть фюзеляжа. Обшивка выполнена из легкого сплава. По конфигурации Sprat являлся равнокрылым бипланом, крылья складывались вдоль фюзеляжа. Единственный прототип выполнил первый полет 24 апреля 1926 года. Sprat проиграл сравнительные испытания самолету Vendace, который и рекомендовали для запуска в серию, но и его производство наладить не удалось по экономическим причинам. Силовая установка: V-образный мотор Rolls-Royce Falcon III мощностью 275 л. с.
Размеры: размах крыла 10,59 м; длина 8,92 м; высота 3,35 м; площадь крыльев 37,76 м! 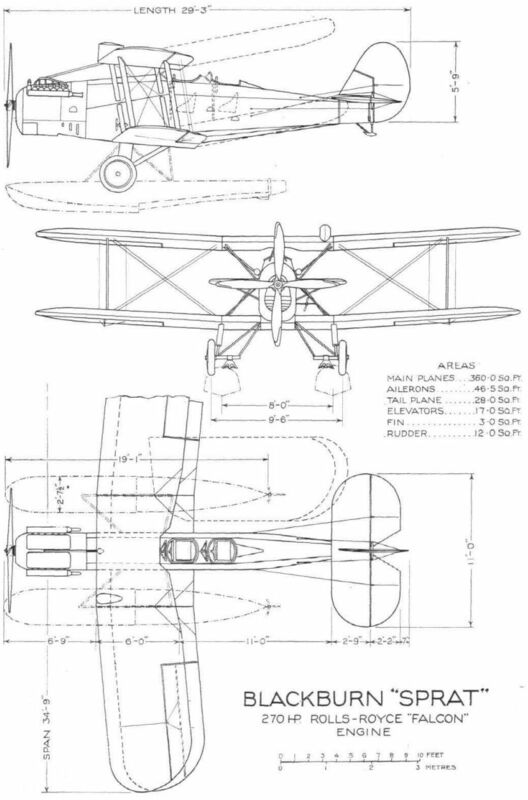 In general design the Blackburn "Sprat" is of the normal biplane type, with top and bottom wings of equal span. A feature of the design is that the machine can be changed rapidly from a landplane to a seaplane and vice versa, the two types of undercarriage being so designed that each is a complete unit in itself, detachable at the fuselage and wing root joints. As a seaplane the "Sprat" is of the twin-float type, the float undercarriage being so designed that no cross tubes or struts are required. As a landplane the "Sprat" has an undercarriage similar in design to that of the well known "Swift." In the general arrangement drawings the machine is shown with the land undercarriage drawn in full lines and the float chassis in dotted lines. Controllability in the air and on the water, low landing speed, good view from both cockpits, and economy in operation and maintenance were the objects aimed at in the design of the Blackburn "Sprat." Concerning the manoeuvrability and general behaviour on the water, the form and dimensions of the floats are based upon those fitted to the Blackburn "Dart," which has been in use for a long time at the Blackburn training school at Brough. These floats have been tested in the tank in model form, and it was found that they ran very cleanly, had no tendency to “porpoising," and led to stable conditions when trimmed to take off. Full scale tests have confirmed these results. The "Dart" seaplane takes off with the pilot's hands off all controls. In order to facilitate manoeuvring at low speeds, the floats are fitted with water rudders. While on the subject of floats, it should be pointed out that the "Sprat" can be supplied with either wood floats or all-Duralumin floats. 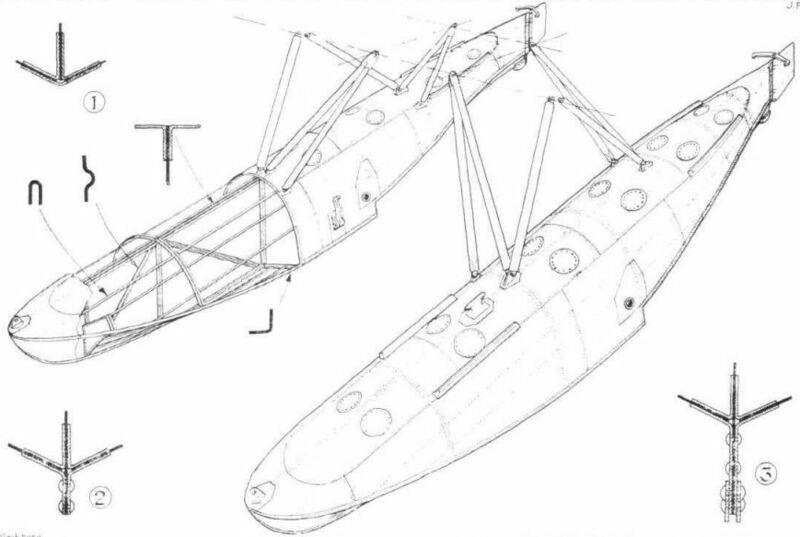 One of our sketches shows the metal floats, with some of their constructional details. It will be seen that the floats are of the vee-bottom rounded deck type with single steps, and the keelson extends from the keel to the deck, the chassis struts being attached to the keelson and bedding down on the keel. These sketches also indicate the attachments on the floats for wheeled trestles used in changing one type of undercarriage for the other, and as there are no cross tubes or axles in either undercarriage, each half of either can be detached or attached independently of the other half, which naturally facilitates the operation. Constructionally the "Sprat" follows the "Swift" and "Dart" types, the fuselage being built up in such a manner that components are grouped in units easy of access and removal with a minimum of disturbance of the main structure. There are three such units, the engine unit, the central unit or backbone (which is built entirely of steel tubing) to which all the main components are attached, and the tail portion, which is of wood construction. The engine unit is quickly detachable by means of four bolts, just forward of the fireproof bulkhead, and is so designed that when disconnected from the fuselage it forms its own engine bed and can be set down on a flat bench or on the floor. The accommodation for pupil and instructor (the latter occupying the aft cockpit) is such that not only is communication between them made as easy as possible, but both obtain an excellent view, as they are situated aft of the trailing edge of the top plane, which is cut away near the centre. In point of fact, the view is equal to that of the "Swift" torpedo carrier, which has proved exceptionally good for deck landing work, where a good view is essential. A neat feature is the placing of the instruments on the rear top spar, where they can be seen by both occupants. The biplane wings are of normal construction, and are designed to fold, so that in this state the machine occupies a very small space. The land undercarriage, as already mentioned, is similar to that of the "Swift," and has two independent halves, unconnected by axles. The shock-absorbing gear is in the form of rubber blocks in compression, a form which is becoming increasingly popular, and which has been used by the Blackburn company for several years. With the sloping centre-section struts typical of the torpedo plane, the chassis attachments are situated a fair distance out from the centre, thus giving a very wide wheel track and making the machine particularly stable on the ground. Moreover, the absence of any cross-members renders the machine much less likely to "nose over" if a landing in tall grass or corn should be necessary. In the illustrations the grapples used for deck landing may be seen. The weight of the power unit is, of course, the same for the seaplane and the landplane, and is made up as follows: Engine (dry), 725 lbs. ; water in engine, 25 lbs. ; radiator and water, 160 lbs. ; propeller, 50 lbs. ; engine accessories and piping, 90 lbs. ; gas starter, 65 lbs. Total weight of engine unit, 1,115 lbs. This represents a percentage weight of 31-4 for the seaplane and 34-65 for the landplane. The items connected with the fuel, tanks, etc., are also identical for both types, and are as follows: Fuel (56 gallons), 425 lbs. ; oil (4 gallons), 40 lbs. ; water (1 1/2 gallons), 15 lbs. ; fuel tanks, 60 lbs. ; oil tank, 10 lbs. ; water tanks, 6 lbs. Total, 556 lbs., which represents 15-7 per cent, in the case of the seaplane and 17-25 per cent, for the landplane. The following military load is carried in both types of machine: Crew (2), 360 lbs. ; instruments, 55 lbs. ; Very pistol and 12 cartridges, 7 lbs. Total, 422 lbs., or 11-9 per cent, of the total loaded weight of the seaplane and 13-1 per cent, of the landplane. The total loaded weight of the seaplane is 3,500 lbs., and of the landplane 3,220 lbs. Climb (sea level) 937 ft./min. 1,100 ft./min. Time to 5,000 ft. 6 1/2 mins 5 1/2 mins. Time to 10,000 ft. 16 mins. 13 mins. Service ceiling 15,700 ft. 17,500 ft. THE BLACKBURN "SPRAT": This front view shows the divided undercarriage, for which a float chassis can be substituted. The Blackburn "Sprat" landing at Brough after a test flight. The Blackburn "Sprat" (Rolls-Royce "Falcon") The "Sprat," designed and built by the Blackburn Aeroplane and Motor Company of Leeds, is a training machine of relatively low power, and a feature of it is that it can be used either as a land aeroplane or as a twin-float seaplane, the two undercarriages being interchangeable. A particularly good view from both cockpits is obtained, as they are placed aft of the trailing edge of the top plane, a feature of value in all machines, but particularly in a training type, especially as the "Sprat" is also to be used for training in the landing on the deck of a ship, where a very small divergence from the correct spot may easily spell disaster. 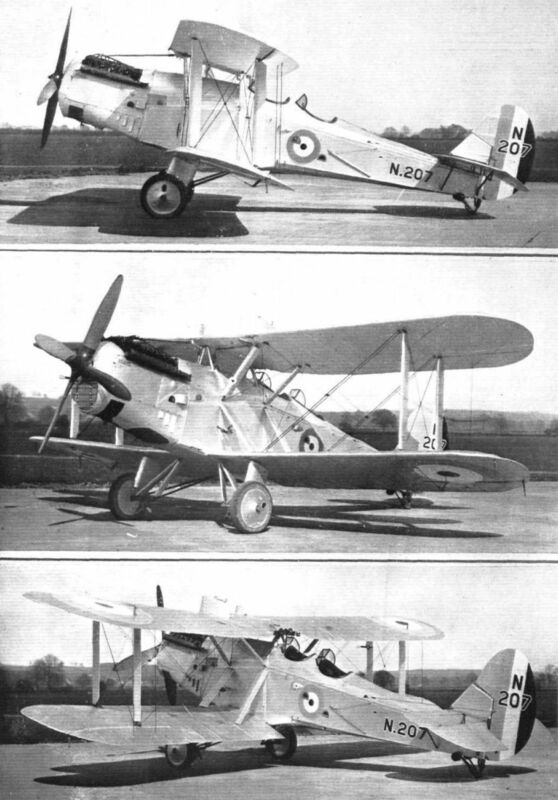 THE BLACKBURN "SPRAT," three views of which are shown, is a training machine convertible into a landplane or seaplane. The engine fitted as standard is a Rolls-Royce "Falcon" of 275 h.p. Prototype of the Blackburn Sprat (N.207) shown here in floatplane version. For conversion adjustable trestles were placed under the nose and rear of fuselage, and the aircraft raised clear of the ground allowing the change to be made quickly. THE BLACKBURN "SPRAT": Some constructional details. 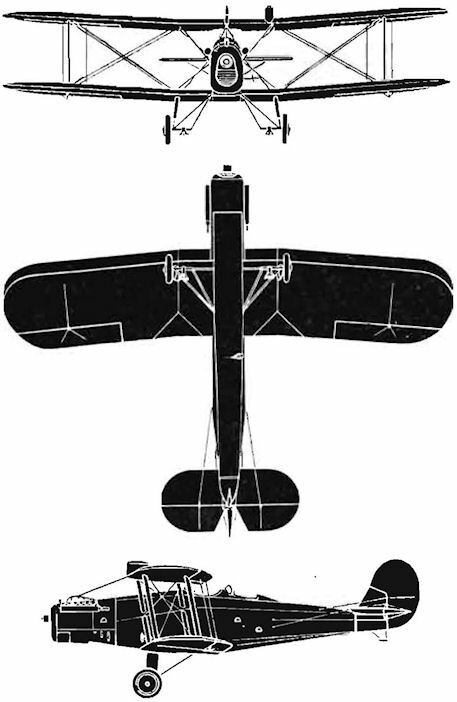 The main sketch shows the two Duralumin floats, with their struts. The 12 inspection holes in each float have their covers riveted on. The transverse tubes through the floats serve to accommodate the beaching chassis, to which a jack action is given by levers (not shown) held in position by catches, of which that on the starboard float is shown. The float framework is also illustrated, with sections of certain main members. At 1, is shown the joint of the keelson to keel and planking near the bows, while 2 illustrates the same joint some distance aft of the step, and 3 the joint, with steel shoe on keel, immediately aft of the step. Note that water rudders are fitted in order to give good manoeuvrability on the water. THE BLACKBURN "SPRAT": In order to accommodate pilots of different height, the foot bars are made adjustable, the means of adjustment being such that the cables are always maintained at an even tension. On the right a sketch showing a typical cowling clip with locking device.